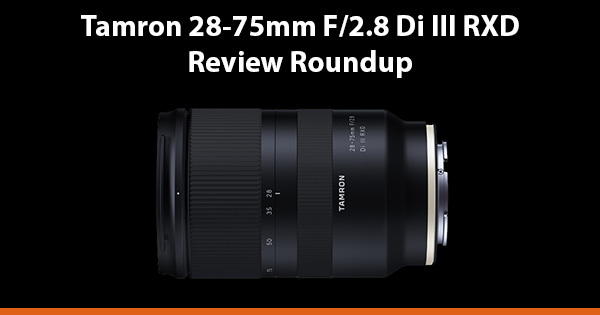 The Tamron 28-75mm F/2.8 Di III RXD lens for Sony Full-Frame E-mount is the first third-party lens that has the potential to cannibalize sales of Sony’s own FE 24-70mm F2.8 GM lens. Priced at around $799.00 or £749.00, this lens costs around $1400 less than Sony’s 24-70mm F2.8 G-Master, so it will definitely appeal to many Alpha Shooters who don’t have the budget for the G-Master, or would simply rather invest the savings in other gear, or beer. But is the Tamron 28-75mm F/2.8 Di III RXD a good investment? Well since since it’s sold out in many stores and early reviews are extremely positive, I’d say it’s looking like a very good investment indeed. If you are interested in picking up a copy of this lens for your own gear bag, then here’s a roundup of the best reviews for this lens to-date, both video and written. Please do let me know in the comments below if I’ve missed any reviews worth including, or if you already own this lens then it would be great to hear your thoughts as well. Important Note: Early versions of this lens had some autofocus issues that some early reviews picked up on. Thankfully these have been addressed with a firmware update from Tamron. If you prefer to sit back and watch reviews, then these are the best reviews for the Tamron 28-75mm F/2.8 on YouTube worth watching. If you prefer written reviews, then these are the ones worth reading. Sony Ambassador Albert Dros concludes that as someone who normally doesn’t normally use a 24-70 lens, he will now start to use this focal length more just because of this lens. He loves how light the lens is, and together with the amazing sharpness make this a perfect landscape lens. You can read his full review here. Leonardo Carrizo really enjoyed the awesome versatility of the Tamron 28-75mm f/2.8 Di RXD lens for Sony Full-Frame E-Mount. Fast and sharp, he says that it can easily become the only lens you need for typical travel and street photography. He also adds that he would not hesitate to take this lens on a commercial or editorial assignment, so long as he has the Sony a7R III to go with it. Read his full review and checkout his superb sample photos here. Jordan Steele says that the Tamron 28-75mm f/2.8 is excellent value for money, rather sharp, and produces very pleasing images with good overall image rendering. Bokeh can get a bit chunky at times, and there’s some distortion that you’ll have to correct, but when taken as a whole, the optical performance of the lens is quite good. You can read his full review here. Jannik Peters concludes that the lens feels and handles like the Sony kit lens, which is not bad but nothing to write home about either. The bokeh has many facets but is generally very distance dependant, the closer the focus the better the bokeh. The images are almost entirely free of chromatic aberrations and the AF is quite fast but not the fastest, quiet but not silent. Read his full review here. Tamron appear to have a real winner on their hands with this lens. All of the reviews that I’ve watched and read have been very positive overall. It has very good central sharpness across the focal range, nice bokeh at close distances, and accurate and fast autofcous all in a small and lightweight body that is also weather sealed. Sure it’s not perfect, there is some vignetting at wide apertures and the bokeh at longer distances is not very pleasing, but for the price there is nothing else out there that’s this good for Sony Full-Frame E-Mount right now. Compared with the Sony 24-70mm F2.8 G-Master, the GM has better color rendition, micro contrast, improved edge sharpness, smoother and creamier bokeh, and a much higher build quality. On the flip side, it’s also much heavier, larger, and also costs $1400 more than the Tamron. I think for many shooters the Tamron is going to be the preferred choice, and I’m certain that the Sony 24-70 F2.8 G Master sales figures over the coming years will show this. But if it helps to sell Sony camera bodies then I don’t think Sony will be too disappointed. Do you own this lens? If so, it would be great to hear your thoughts in the comments below. I don’t like to ask for PayPal donations but you can easily support this site by purchasing your gear through the affiliate links (denoted with *) on this page or visiting the Alpha Shooters Amazon Store (US Only) to check out my recommended Sony Alpha Gear and Accessories. If you buy something after clicking a link I may receive a small commission, but don’t worry as the price still remains the same for you. If you do choose to buy through my links, thank you very much for your kind support and I look forward to seeing your shots in one of the many Alpha Shooters Facebook Groups that I run.